Since 1997, Holland’s long-running outdoor music festival Awakenings has been a go-to destination for techno lovers around the globe. 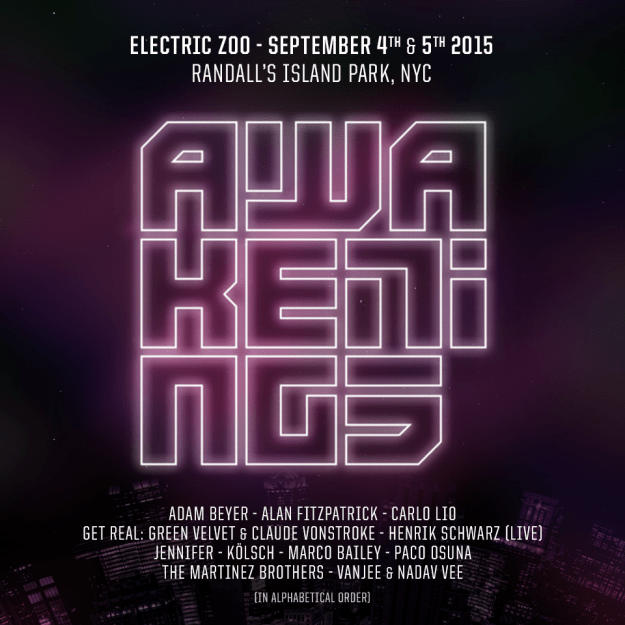 On September 4 & 5, Awakenings will make its way across the Atlantic for its North American debut with a stage at ELECTRIC ZOO: TRANSFORMED. The artists who will make up the stage’s lineup represent a sampling of what Awakenings present at their massive flagship June festival just outside Amsterdam. At Electric Zoo, techno fans can experience the debut of Get Real, the pairing of legendary techno producer and DJ Green Velvet with Claude Von Stroke, a live performance from Henrik Schwarz and sets from mainstays such as Paco Osuna and The Martinez Brothers alongside newcomers like Jennifer and Kolsch. As Electric Zoo: Transformed comes back to New York City for its seventh annual instalment, its creative partnership with electronic music experience pioneer ID&T will reimagine and reenergize the festival like never before. ID&T is well-known for its cutting-edge production of events such as Mysteryland, Sensation, Tomorrowland, Q-dance and TomorrowWorld. Founded in 2009 and taking place in the beautiful Randall’s Island Park each Labor Day Weekend, Electric Zoo brings a wide variety of the top DJ acts from around the world and across the spectrum of electronic music’s various sub-genres. With fans coming together from across the globe to the world’s favourite city, Electric Zoo is a chance to celebrate and connect.